Are the public ahead of the prime minister on mental health? January 09, 2017, 11:49 p.m. Yesterday Prime Minister Theresa May announced funding for a new approach to mental health support as part of a wider speech on her vision of a “Shared Society” – itself a rebranding of David Cameron’s “Big Society”. During her speech, the Prime Minister declared that “For too long mental illness has been something of a hidden injustice in our country, shrouded in a completely unacceptable stigma and dangerously disregarded as a secondary issue to physical health”. But how far is this the case among the general public? 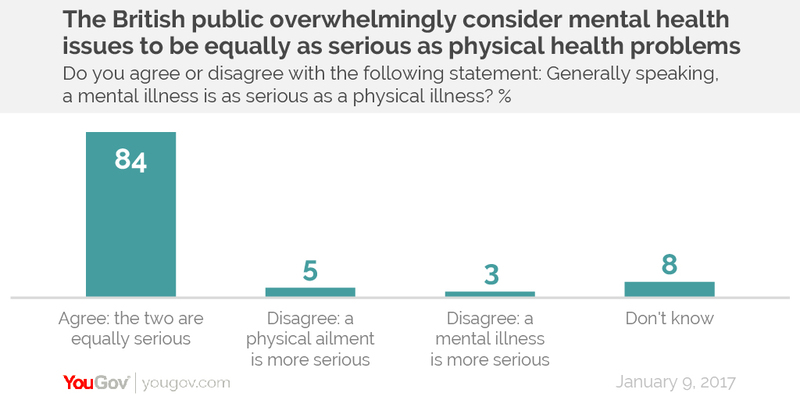 New research by YouGov, conducted on the day of the speech itself, finds that fully 84% of the British public agree with the statement “generally speaking, a mental illness is as serious as a physical illness”. Ultimately, just 5% of people believe mental health issues to be secondary to physical ones, whilst a further 3% say that mental health problems are the more serious. The seriousness of mental illness is accepted across the entirety of society. Women and older people are the most likely to agree with the statement, at 87% and 89% respectively. Perhaps surprisingly, it is the young who are the least likely to agree, with 80% of 18-39 year olds saying they consider mental and physical health issues to be of equal seriousness (although they are the groups most likely to have given a “don’t know” response, rather than being especially more likely to think one was more serious than the other). During her announcement, the Prime Minister highlighted the cross-party support for mental health services in Parliament, recalling speeches from Conservative MP Charles Walker and Labour MP Kevan Jones about their own personal challenges with mental illness. Similarly, the public is united across the political spectrum in their attitudes towards mental health. UKIP voters were the least likely to consider mental health and physical health issues to be the same, but this figure was still a huge 81%. SNP voters were the most likely to believe mental and physical illnesses to be equally serious, at 91%. 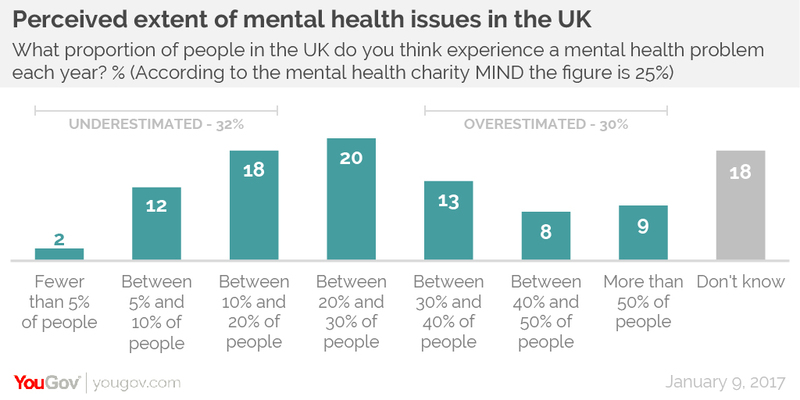 The survey also shows that the injustice of suffering from a mental health illness is not particularly hidden from the British public – in fact, the vast majority of British people know others personally who suffer from mental health problems. 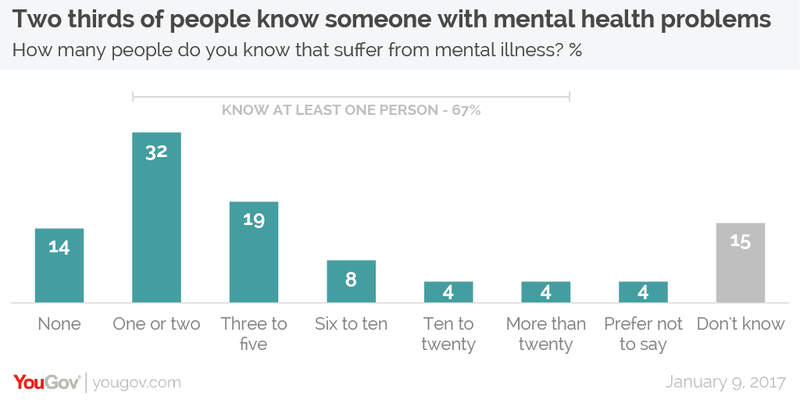 When asked, two thirds said that they know other people with mental health problems. Only 14% of people say they don’t know a single person with mental health problems. Likewise, the public also appreciate that mental health issues are experienced by great numbers of people. According to the mental health charity MIND, a quarter of the UK’s population will experience a mental health problem each year. When YouGov asked people what proportion of the population suffered from mental health issues each year, 20% of people gave an answer in the right ballpark (between 20% and 30%). A third of people underestimated the prevalence of mental health issues, giving an answer of below 20%, whilst a further 30% of people overestimated the number of people with mental health problems. Now, none of this to say that the Prime Minister is not right that about hidden injustice and stigma. People can be aware of the importance of an issue whilst still stigmatising – consciously or unconsciously – those involved. Likewise, when a person says they know people with mental health problems, it may well be that many more people they know also suffer but keep their affliction hidden. But there is one area where mental illness is very clearly held to be secondary to physical illness, and that is in public health policy. In response to May’s speech, Paul Farmer, CEO of the aforementioned mental health charity MIND, highlighted the decades of government neglect and underinvestment in mental health. NHS England’s plan for transforming mental health services has a goal of putting mental health on an equal footing to physical health by 2020/21 – still four years away (if they succeed). If anything, it is perhaps the government that needs to catch up with the public on taking mental health issues seriously.